This is the Niagara Class at 1/2500 as requested by frankfowler. Note, as this was requested to be printed in Detail Plastic, this is one of the rare occasions i didn't choose the best quality orientation for Detail Plastic (upside up) but the cheapest (front up). This is because any of the other orientations added $100 and more to the price for Detail Plastic. 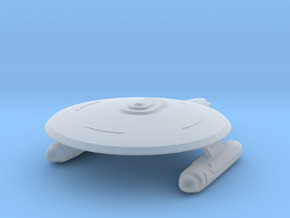 I also hollowed the saucer and the main hull for further reducing the printing cost. The ship is cut into two pieces at the neck, just below the saucer in order to create openings for the cavity inside. You will need to glue both parts together. 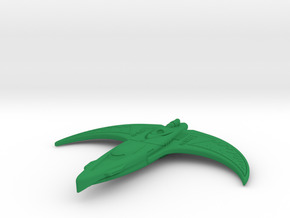 Be aware that the price for Detail Plastic Shapeways calculates for this includes a per file and a per part fee. You only have to pay the per part fee for this when I combine this with one or more items in Detail Plastic. So ask me to combine all the items you want to one single file to get it cheaper. If you need this in another material, size, quantity or combined with one or more of my other parts for cheaper printing, just let me know. I will try to make it as you need. If you want to see my custom-made Star Trek Tactics ships, visit my tread on hcrealms.com. 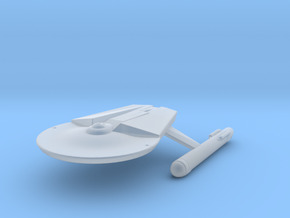 Original model by Max Loef and/or a member of his team from the Star Trek Armada III mod. Please visit http://www.moddb.com/mods/star-trek-armada-3 and support the developers. Used without markup. I repaired and optimized the file for 3D print. If you are the original creator of this mesh, please leave me a message to give you proper credit or if you want me to not use this mesh.